Pool owners have made All-Safe Pool Fence & Covers as their #1 choice for Pool Safety Covers and pool fences for over the past 25 years. Send us an email or give us a call anytime to set up a time to have one of our safety experts meet with you to discuss your options for pool fence installation, answer your questions and provide you with a FREE quote. Call (800)786-8110 or Click below. Swimming pools are meant to be places of fun, not accidents. However, you cannot always control who goes near your pool, especially when it comes to children and pets. But you can provide an additional layer of protection by adding a Pool safety cover, along with your existing pool fence. There are a variety of pool covers, and some are designed for safety, others to keep out the debris and some to trap the heat from the sun. So if you are looking to enhance the safety around your pool, you should choose from these 5 safety covers. Choose the right one based on your budget and need for convenience. It is usually used by homeowners for closing the pool for the winter. You can also use it in the summer. When safety is your priority, you should choose a tie-down cover that is specially designed for safety. It is important to ensure that the cover is made to ASTM for safety standards. Mesh is a great type of material for inground swimming pools. Some are designed as Pool safety covers and are capable of holding a significant amount of weight. These covers allow the rainwater to pass through, eliminating the need for pumping the water out. If your budget allows it, it is recommended choosing an automatic cover for your pool. It is considered one of the best options for many reasons. It is made of solid vinyl and can automatically slide over the pool using a button or key switch. Even though automatic types of pool covers are costlier, they save you money in the long term. Overall, they are considered highly effective and one of the safest options. Besides these options, you could also have your Pool safety cover custom designed to your specifications. 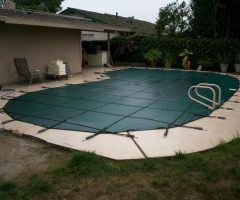 You can have the cover made to fit any type of pool having any shape. You could choose the material to suit your safety requirements. There are so many options to choose from, and it is most likely that you can find a Pool safety cover from the above options. However, you could also have one designed to your preferences. Any one of these types of inground pool covers can help keep your family safe around your pool, but it’s best to talk to an expert first. Contact a local professional who can help you decide on the right cover for your pool.